U-type platform with wheels and handle for move. Convenient for weighing goods on pallet. C.S. surface: painted& baked or galvanized. S.S. surface: polished & brushed. Four load cells: alloy steel or stainless steel. Resolution: normally 3000e, optional 6000d. 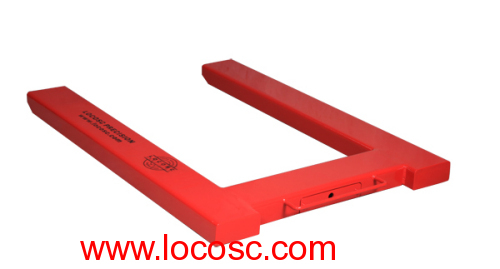 Locosc has intellectual property rights for the stamped floor scale, with own manufacture instrument, Mould and fixture. we Can reach annually production capability 1000 sets. And at present the Maximum specification is 150kg, 400*500mm .Specially in angle discrepancy, repetition, and creep properties Locosc productivity can reach European standard or surpass it in the same product lines. Further, The specification 300kg, 400*500mm stamped scale is expected to be put into production in Mar.2008.and hope you can enjoy it.